In January 2014, when we wrote the first draft of our election campaign plan for governor and lieutenant governor of New York, we set down what we thought were four ambitious goals. But as the campaign has unfolded, it appears we aimed too low. We have revised our goals upwards. Our first goal was to receive at least 50,000 votes, which is the threshold for securing and maintaining a ballot line for the Green Party in all upcoming New York State elections. With ballot status, it is much easier for our candidates to run for local office. Currently two Greens hold elected office as village mayors and several more as town councilors. Our long-term strategy is to elect many more local officials, establishing a base for viable runs for New York state legislative and U.S. Congress. Gloria Mattera and Howie Hawkins. 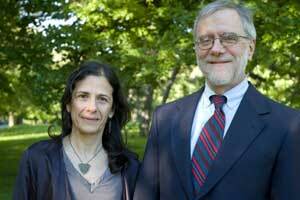 In 2010 our ticket (Howie Hawkins for governor and Gloria Mattera for lieutenant governor) received 59,906 votes. The political context this year is similar. In a state with twice as many registered Democrats as Republicans, a strong Democratic candidate is way ahead in the polls. Since that context makes a vote for progressive third party ticket “safe,” we felt that 50,000 votes was a very achievable goal. Andrew Cuomo, the Democratic incumbent, has made meeting that goal easier. His administration has been very conservative on fiscal, economic, and educational issues. He attacked public employees and won contract concessions. He established a new sixth tier in the public employee pension system with reduced benefits for new hires. He got state budgets passed that gave more tax breaks to the rich and big corporations while imposing austerity on schools and public services — even underfunding schools below a court-ordered minimum. He froze state revenue sharing and imposed a local property tax cap, forcing local governments and school districts to cut deeply into staffing and services. Over the last five years New York lost 400,000 state and local public employees, including 40,000 in the schools. Public school teachers are especially upset with Cuomo for his outspoken support for high-stakes testing linked to Common Core, charter schools, and private education tax credits while underfunding public education. Cuomo’s economic development policy is all trickle-down supply-side tax breaks for big business and rich people, plus casinos in a saturated gaming market. Four decades of policies coddling the rich has left upstate New York a deeply depressed rust belt of former manufacturing cities and towns. In 1980, the richest one percent received 10% of all state income; today it is 35%. And in New York City, the top one percent has grabbed 45% of all income. While Cuomo says the rich need more money to invest in job creation, his real economic objective seems to be getting them to invest in his campaign. Over 99% of Cuomo’s donations are $1,000 or more, with 81% at $10,000 or more, and 45% contributing $40,000 or more. 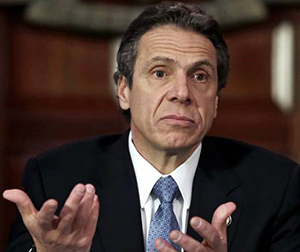 Cuomo had 715 contributors between January 15 and July 15, 2014. I had 654, just 61 fewer. But his average donation was $7,723, mine was $77. He had $35 million to spend. I had $30,000. Now that he has carried out his plan for fiscal austerity, we expect a much larger vote from public sector workers. As the gubernatorial candidate, I am a working Teamster. My running mate, Brian Jones, is a union teacher from New York City. We believe we are the ticket attractive to working people, particularly public sector workers fighting against austerity. Our second goal set an ambitious vote total that we felt was within our reach if we ran a well-organized campaign. We chose five percent and 250,000 votes. That would be the most votes for an independent left gubernatorial ticket in New York State history, surpassing the 221,996 votes (4.2%) received in 1950 by John McManus — a co-founder of the Guardian, a radical weekly newspaper — who ran on the American Labor Party line. The ALP was formed in 1936 as a “fusion” party in New York, thus enabling candidates to appear on more than one party’s ballot line. The ALP goal was to get socialists to vote for New Deal Democrats on their line. By the 1938 election, the ALP/Democratic fusion campaign pushed Norman Thomas, the Socialist Party candidate, well below the 50,000 vote threshold; he received only 24,980 votes. The Socialists lost the automatic ballot line they had enjoyed since 1916 and have never recovered it. By 1950, however, Cold War liberals had split from ALP to form the Liberal Party and thus serve as a second ballot line for the Democrats. The ALP ran independent campaigns against both major parties in the early 1950s, but lost their ballot line in 1954 with McManus receiving 48,886. McManus tried again as the Independent Socialist candidate for governor in 1958, but received only 31,658 votes. Winning five percent would nearly equal the best showing for an independent left candidate in New York history. That was in 1918, when Charles Ervin, on the Socialist line, received 5.7% of the vote, which was 121,705 votes — at a time when women still did not have the franchise. We also chose our second goal because we felt that equaling the best results for independent left gubernatorial tickets in New York history would give the Green Party standing with the public and the media as a voice that had to be included in policy debates. That would change the political dynamic in New York state. Today, the major parties do differ somewhat on social issues, but the debate on economic, education, environment, and energy policies is over how to best implement a conservative pro-corporate consensus. To get the take of the “left” on public affairs, the New York media turns to liberal Democrats and the Working Families Party, a fusion party that serves as a second ballot line for Democrats. While the liberals complain about the conservative policy consensus, they campaign for the re-election of the conservative leaders of the Democratic Party. WFP pitches votes on their line as a way to “send a progressive message” to these Democrats. Greens argue that the message these Democrats hear is that they can take the progressives’ votes for granted because they will vote for the Democrats no matter how far they tack to the right to compete for swing votes with the Republicans. By running independent candidates, Greens believe they can move the policy debate to the left by forcing the Democrats to compete for the votes of progressives. Given Cuomo’s conservative record on fiscal, economic, and educational policies, a lot of rank-and-file WFP members felt the same way about the 2014 gubernatorial race. As WFP prepared for its nominating convention, the media reported a movement within the party to run its own candidate against Cuomo. A mid-April poll asked voters to choose between a “more liberal or progressive” Working Families candidate, Cuomo, and the Republican, Rob Astorino, the Westchester County Executive. The unnamed WFP candidate received 24%, as did Astorino, with Cuomo coming in at 39%. However the Greens expected Working Families to cross-endorse Cuomo, which they did at the end of May in a deal brokered at New York City Mayor Bill de Blasio’s house the week before their convention. Although billed as a union-backed party, WPF actually receives the majority of its funding from Democratic candidates who hire Working Families to do their field operation. Some service sector unions do fund Working Families, particularly 1199SEIU and CWA, but most public sector and industrial unions do not. Cuomo’s seemingly invincible facade was cracked in late July by a 7,000 word front page New York Times article detailing how Cuomo and his staff interfered with a public corruption panel he had created and then abruptly shut down after it started issuing subpoenas to his political allies and funders. In a state where more than 30 state legislators and one governor have been walked or shamed out of office for criminal misconduct over the last 15 years, and where Cuomo campaigned in 2010 to “Clean Up Albany,” this scandal could undermine his support. Cuomo has used his support for gay marriage and abortion rights to craft a progressive narrative for himself while he has been very conservative on economic and educational issues. He gets away with it in part because he is living off the New Deal rhetoric of his father, former governor Mario Cuomo. Yet Mario, like Andrew, was an economic conservative who flattened the tax structure, expanded corporate welfare, and cut social services while building prisons for the mass incarceration of poor people of color targeted by Rockefeller’s drug laws and conservative stop-and-frisk and “broken windows” policing. Between mid-June and the end of July I have been included in the four gubernatorial race polls and my percentages have increased from four to seven percent. Astorino is bouncing around between 21-24% while Cuomo has dropped from 60% to 54%. If we can continue to gain support in the polls, who knows what could happen once the debate is in gear after Labor Day? Moving the policy debate was the third goal of our campaign plan. In 2010, I campaigned for a fracking ban while most of the environmental groups were calling for a moratorium to study it; some were actually promoting fracking on the grounds that natural gas is the lesser evil to coal. We got so much traction for that demand that immediately after the election the proposal to ban fracking became the dominant one. Our progressive fiscal policies were appreciated by public employee, community, and public education organizations, but have had little impact on the pro-austerity narrative that dominates in the media. We are hopeful of changing that fiscal narrative. We point out that the Democrats have had control of the executive office and both houses at the state and federal level many times, but have failed to establish any of these rights over 70 years. They no longer even pretend to be for them. We call for the right to a job, with public jobs for the unemployed; the right to a living wage, starting with a $15 minimum; the right to health care through a state single-payer public insurance plan; the right to a good education through fully-funded desegregated public schools and tuition-free public colleges; the right to affordable housing through home rule on rent control and increased public housing; the right to affordable mobility through expanded public transit, including intra- and inter-city light rails; and the right to a sustainable environment, starting with building a 100% clean energy system by 2030. A peer-reviewed study in Energy Policy recently documented the economic and technical feasibility with commercially available technology of our call for 100% clean energy by 2030 in New York State. Creating green buildings, both new and retrofitted, are a major part of the 4.5 million construction and manufacturing jobs that the study says a clean energy program could create over the next 15 years. We would pay for the Green New Deal by restoring the more progressive tax structure New York had in the 1970s: more progressive personal and business income taxes, retaining the full amount of New York’s Stock Transfer Tax and eliminating corporate welfare programs that would give 95% of New Yorkers a tax cut while increasing state revenues 20%. That money would also enable us to restore revenue sharing to eight percent of state revenues rather than the current level of less than one percent. Along with the anti-fracking movement, the defense of public education is the movement with the most energy in this election. The rural and inner city school districts upstate are angry about underfunding. Every school district, even the affluent suburban districts, is up in arms about high-stakes testing linked to Common Core. Our campaign is highlighting a program to fully and equitably fund public schools and to replace the test-and-punish corporate privatization agenda pushed by Cuomo with a support-and-improve approach that puts teachers and local school districts in charge of developing curricula and qualitative assessments of students and teachers. We are also emphasizing a program to desegregate New York’s schools, which are among the most segregated in the nation. It is a double segregation — by race and class — that makes school district and municipal lines the enforcers of the New Jim Crow school-to-prison pipeline. School segregation is in large part a function of residential segregation. In addition to immediate attention to discriminatory attendance zones within districts and programs to encourage race and class desegregation across district lines, we are calling for a major commitment to fair housing enforcement and to public housing designed to promote residential desegregation. Between the 1930s and the 1960s, public housing projects made concentrated poverty and segregation worse. Since the 1970s, when public housing was largely abandoned in favor of Section 8 vouchers and tax breaks to for-profit developers, the anemic enforcement of fair housing laws has made the real estate market the vehicle for further segregation. We propose a large-scale program of new public housing that is different from the old projects. It would be public housing that is mixed-race, mixed-income, scattered-site, clean energy positive and carbon negative, in cities and suburbs. It is also a jobs program, an affordable housing program, and a clean energy program as well as a desegregation program. Our campaign plan extends past the election. The post-election focus will be on building the Green Party as a mass party in New York for all progressives and socialists who agree on the need for united political action independent of the two-party system of corporate rule. Our campaign organization is built around local campaign committees open to all supporters, who range from members of socialist organizations to disgruntled Democrats and Working Families Party members to unaffiliated activists in social movements. The primary goal of these committees is to maximize the vote, with leafleting, canvassing, fundraising, and developing lists of supporters among their activities. We also encourage campaign workers to talk about how the left needs to organize, not just mobilize. We want a mass party that organizes working people to meet, debate, decide, and act for themselves through local party organizations. Our goal is not to simply elect Greens to office, but to organize a movement and party that can unite the working-class majority and develop its capacity to govern. Most progressive organizing today is just mobilizing people for activities that have been pre-determined by leadership and staff, not organizing working people so they can work out their own proposals to solve social problems and develop action plans. We want to develop our members as organizers and leaders. We want to balance political education and activism. We want to be as active between as well as during elections. And this is difficult to balance in New York with elections every year — local in odd years, state and federal in even years. We want to build a mass party that provides significant funding for its activities through a dues-paying membership, much as unions accumulate significant resources through dues. All this is very different from the traditional American party structure, where atomized followers are not organized into local party branches for self-activity but just mobilized for elections by competing entrepreneurial candidates’ campaign organizations that are financed by the very rich. We hope that a strong vote in 2014 will be our calling card to open the door to recruiting electoral supporters to become active members because they see the Green Party as a viable party in which it is worth investing their time and money. Ending militarized policing targeted at people of color is another major theme of our gubernatorial campaign in conjunction with Green candidates for Attorney General, Ramon Jimenez and Comptroller, Theresa Portelli. We call for a Truth, Justice and Reconciliation Commission to examine the disproportionate impact of the war on drugs and mass incarceration on poor communities of color and to recommend corrective policies and reparations. Howie Hawkins is a long time labor activist in Syracuse, New York, and is currently running as the Green Party candidate for Governor of New York. For more information, go to Howie’s website. This article appears in the September-October 2014 issue of Against the Current.